Light Fog and Gift Cards can make it much more interesting. If you feel the starting positions are unfair, due to sandwiching, just change the base bonuses. Review by Teckmantle on 7/4/2012. I played this as a single game against 3 AIs (and no cards). The board is attractive and intriguing and the opening phase of the game was very enjoyable, but I quickly got the upper hand and the endgame was (I'm sorry to say) just boring with 50 armies added to my total each move, I pulverised the opposition. Perhaps plays better as 2v2 game? May try again later. Interesting execution of the race-to-the-top concept. I think this is a pvp-only map, as the AI makes a mess of things early on. Review by edwga on 7/13/2012. 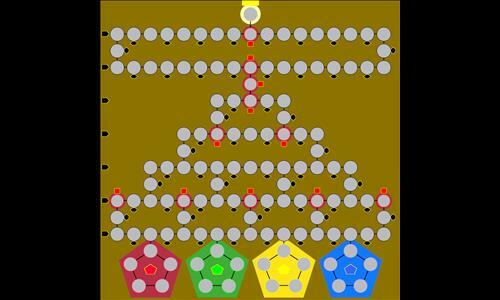 The normal starting positions (in the lower pentagons) encourage upwards rushing while fending off attacks from the other players. However, the game soon becomes a turtle-fest, with the players who make it to the upper rows trying to penetrate the barricades and the players who get stuck below attempting to capture the lower bonuses. Once someone makes it to the top, it becomes a question of who has the bigger stack. The other starting position (with 1 player starting at the top, and the others starting in the pentagons) is even worse, because it seems that no matter what, the player at the top creates a massive 700 stack and annihilates any stacks the players send from below (which usually totals about 300 - 400). Review by Kat' on 7/5/2012. It's okay. AI can't handle negative bonuses and will kill itself running for the Finish while neglecting other income sources. I guess it would be more interesting in PvP. Review by TheBoyGamersFAN on 7/26/2015. Review by Krulle on 8/6/2013. Review by Ancus on 7/1/2012. It felt like there was potential but i got lost on why the defaults for the pentagons were different.